Please note that the content of this book primarily consists of articles available from Wikipedia or other free sources online. 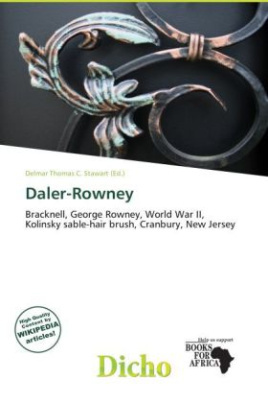 Daler-Rowney is a fine art materials manufacturer based in Bracknell, United Kingdom. It sells a wide range of artist products such as paints, artist surfaces, brushes and a range of accessories. In 1783, Richard and Thomas Rowney opened premises in central London where they started selling perfumes and wig powder, which was the beginning of the Rowney Company. As the fashion for wigs soon changed, the Rowney brothers re-focused their talent and concentrated on producing artists' colours.